Display the current date and time as well as safety records for three departments or teams. All displays have 2.3” digit height and the sign is fully customizable online. This scoreboard allows workers to take pride in the safety of their workplace, and serves as a reminder of the importance of vigilance in any work environment. 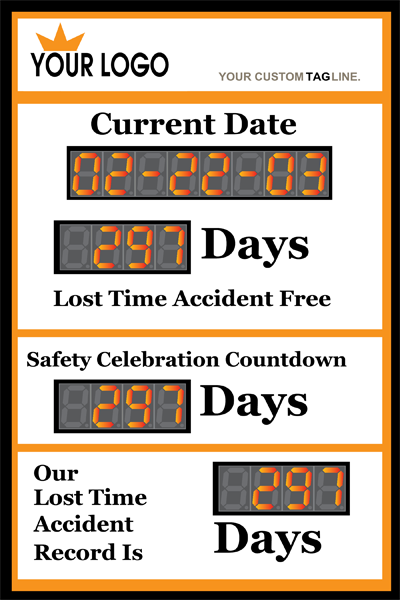 This 36" high by 24" wide sign includes three 2.3" counter modules and a 2.3" calendar module. 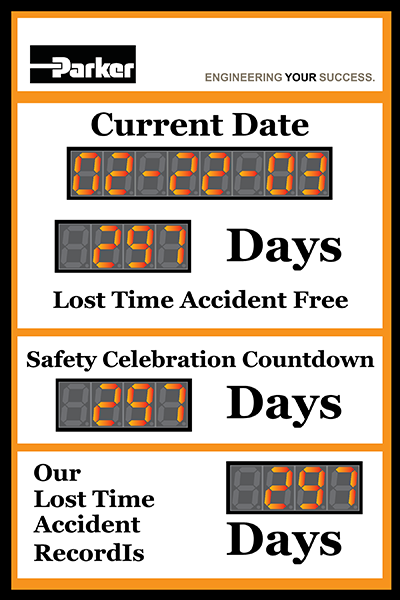 The three day counters allow you to track safe days for multiple departments. Each module can be configured to count up or down automatically so you can track time until a safety event or track the number of days that have passed following a workplace accident for multiple teams. The calendar module can be set to show the current date or time, or cycle between each. The calendar module displays the current date MM-DD-YY. Display current time HH.MM.SS. RETIRING PRODUCT. The functionality of our calendar module has been rolled into our standard 8 digit display.